(Nanowerk Spotlight) A number of neurodegenerative disorders, such as Parkinson's or Alzheimer Disease, may potentially be treated by gene therapy, i.e. the delivery of therapeutic genes to neurons. Currently, the most common carrier molecules to deliver the therapeutic gene to the patient's target cells are viruses that have been genetically altered to carry normal human DNA. Overall gene delivery efficiency is typically low for nonviral vectors. New research undertaken at The Johns Hopkins University offers a systematic approach to understanding the gene delivery process in neurons and explores the intracellular barriers to nonviral gene delivery and possible ways to improve their effectiveness. The development of nonviral vectors (the delivery tools) is attractive due to the potential for improved safety, reduced ability to provoke an immune response, ease of manufacturing and scale up, and the ability to accommodate larger DNA molecules compared to viral vectors. However, synthetic systems such as polymer-, lipid- and peptide-based gene carriers are typically much less efficient in delivering genes to primary neurons compared to viral vectors. Thus, identifying bottlenecks to efficient nonviral gene delivery in transfection-resistant neurons and testing of new vectors are priorities. Much work has been done already to improve gene delivery into central nervous system (CNS) neurons to treat neurodegenerative disorders using various gene delivery systems with several therapeutic agents. Nevertheless, so far there have been no systematic studies investigating the individual intracellular barriers, which should be the guideline for the design of future gene vectors for CNS therapy. "In our recent study we systematically examined several potential intracellular barriers that may limit the effectiveness of polymeric gene carriers" Professor Justin Hanes from The Johns Hopkins University in Baltimore explained to Nanowerk. 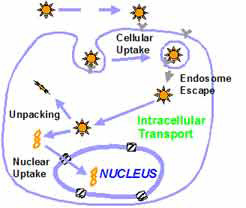 Jung Soo Suk, first author of a paper describing this recent study, elaborates: "In general, potential barriers include cellular uptake, intracellular transport, endosome escape and nuclear import. Based on the mechanistic studies performed by us, we identified cellular uptake as one major barrier that hampers efficient gene delivery in differentiated neurotypic cells." The paper, titled "Gene delivery to differentiated neurotypic cells with RGD and HIV Tat peptide functionalized polymeric nanoparticles" was published in the June 12, 2006 online edition of Biomaterials. To overcome this cellular uptake barrier, the researchers incorporated targeting peptide (i.e. RGD or HIV Tat-1 peptide) to their polymeric gene carriers to endow them with some desirable "virus-like" properties. They found that attachment of both peptides improves cellular uptake substantially. Polycationic polymers have shown significant promise as non-viral gene delivery vectors. PEI is currently the most popular polymer used to deliver genes into various cell types, including neurons. PEI is able to condense genes into small nanoparticles and protect the DNA from degradation by nucleases. In addition, the cationic nature of PEI facilitates entry of these gene vectors into cells. "Surprisingly" says Hanes, "RGD peptide attachment to our gene carrying nanoparticles improved both uptake by neurotypic cells and the escape of the particles from lysosomes. Lysosomes typically degrade gene carriers and prevent them from delivering their DNA payload to the cell nucleus, the target site within the cell for gene therapy." Hanes cautions that this work is still in its early stages and many more obstacles must be overcome. Suk points out that in order to accomplish the ultimate goal of successful clinical application, a thorough investigation of CNS gene delivery mechanisms in vitro and in vivo must be conducted. While this research at Johns Hopkins deals with intracellular barriers, gene vectors in practical applications need first successfully overcome several barriers outside the cells before they reach the target cell itself. "Future work in the line of this study" says Suk, "will include the selection of the optimal administration method and the investigation of extracellular barriers that gene vectors may encounter following the administration. Extensive and systematic approach toward the field will ultimately guide us to design "virus-like" gene vectors without the drawbacks of viruses including safety issues." Specifically, Hanes sees the research in this field focusing on improved biomaterials that are more efficient while remaining safe to use in the CNS; improved basic understanding of the remaining bottlenecks to efficient gene delivery, both inside the cell and outside; and studying the most promising particles in animal models of disease.